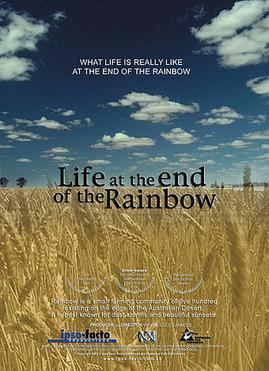 Life at the End of the Rainbow is a 2002 documentary by Australian filmmaker Wayne Coles-Janess about the small farming community of Rainbow, population 500, which lies on the edge of the Big Desert, North Western Victoria, Australia. It is 55 minutes long. The area was originally considered worthless by European-Australian settlers, who fenced it off and abandoned it. The town was established around the start of the 20th century by German immigrant settlers. Its population increased after the first and second World Wars due to the government's policies of subsidies to encourage settlement by veterans. The people of Rainbow have struggled to eke out an existence for more than three generations, with global economics and government policy compounding the difficulties of marginal farming. The film draws from home movies from the 1940s to portray the people in this town.